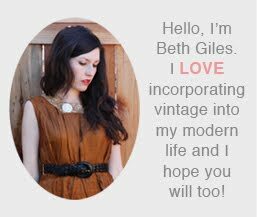 Vintage Clothing Blog | Vintage Wedding Dresses | Salvage Life: Happy Birthday and Congratulations! The "Happy Birthday" is for me because today is my special day and it was wonderful! I spent the day with my daughter and sister at Disneyland (you get in free on your birthday!) and then arrived home to see my husband waiting for me with dinner and flowers. I could not have imagined a better day! And for those of you tuning in for today's drawing, Congratulations to...goldenmeans! I wasn't supposed to work today, so I am going to go now, but tune in this week for new jewelry and accessories in the shop and a sneak peak of what will be at the Speakeasy show this weekend. You came into our store today (Seed) and I didn't introduce myself but my name is Tara. I just looked at your Etsy shop and your blog. I love your stuff! And here's something strange, I totally know your husband, Jeff! I went to Grace Brethren High School Group with him back in the day and our parents are totally friends from church. How weird is that? ?